There will come a time when you need to make data available to your mariaDB application from other database management systems. The CONNECT functionality allows you to do this. This article will cover how to use it to access remote data and some of the challenges and pitfalls you may encounter. In one of our recent projects, we needed to calculate some count statistics from two Oracle 11g database tables and store the results in our mariaDB 10.0.22 database. We were dealing with approximately 2 million rows on each of the Oracle tables and, as we were calculating set theory counts, we needed to compare the keys on both tables. The tables were indexed correctly and performance within Oracle was really good. 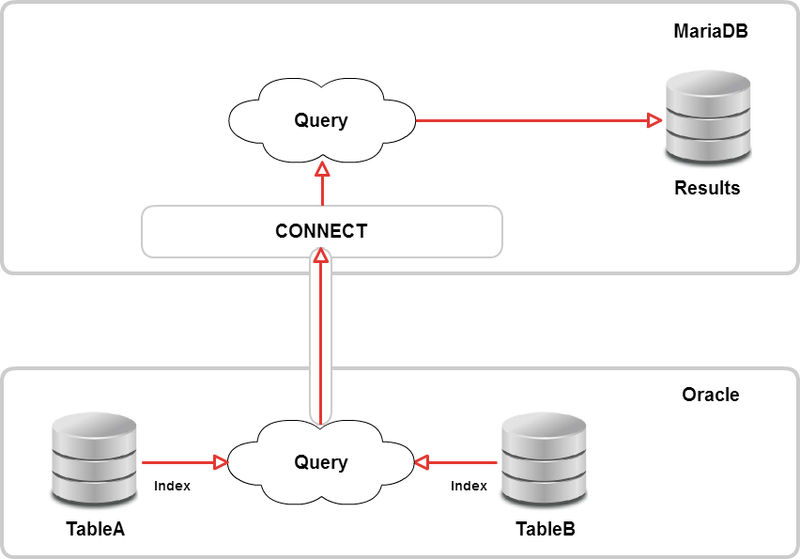 In order to access the Oracle tables we need to set CONNECT up. 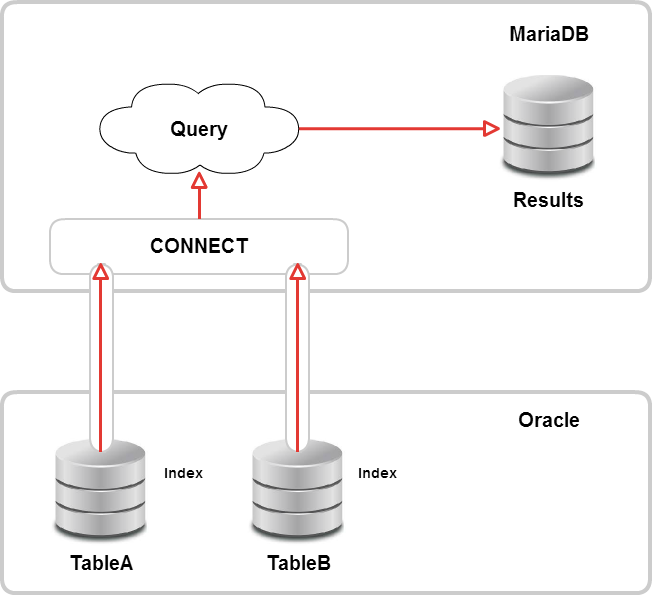 Having rushed through the CONNECT documentation, we set up two CONNECT tables in our mariaDB database, one for each of the remote Oracle tables. When we ran these, the result was successful and the two tables were created. A quick test via “Select * from CONNECT_Remote_Data_TableA” proved that data was indeed flowing from Oracle to mariaDB. We built our queries in mariaDB, referring to the CONNECT tables and started our unit testing. The results were good and we could insert the data returned from them into a mariaDB table. CONNECT was a success and we could now push on with the rest of the development, having built and tested this functionality. Everything went well until we started to ramp up the volume in the Oracle tables. Then we witnessed an alarming degradation in performance that got worse as we added more and more data. At first we struggled to understand what the problem was – the tables were indexed after all and, therefore, access should be really quick. It was only when we started to think through what CONNECT table actually was and did some more reading that we found the problem. The solution was based around where the actual SQL Query was being executed. What’s the usual solution to make a slow query run quickly? Indexing. So we looked at that. In our rush to get this up and running, we had missed the fact that ODBC CONNECT tables cannot be indexed. In effect, all we had created was a conduit or “pipe” to the data which arrived in a stream of unindexed rows that mariaDB then had to work heroically to produce our results from. However, when we executed a “Select count(*) from CONNECT_Remote_Data_Count” we received a strange result – 1. The answer was returned very quickly, which was encouraging. However, we knew that this wasn’t the correct answer – we expected many thousands of entries to be on both tables. After a little more head scratching, we tried “Select * from CONNECT_Remote_Data_Count” and viola – our expected result was returned. In effect we were selecting the content of the CONNECT table’s query. So we now had an Oracle PL/SQL query that was wrapped inside a mariaDB CONNECT “pipe” and being executed remotely in an Oracle database where it could make full use of the indexing. The result was then the only data item being sent down the “pipe” from Oracle to mariaDB. So, as we can see, CONNECT is a powerful thing. It allowed us to build a solution that populated our mariaDB system with results from a query against two tables sat on an Oracle database. The full power of the indexing was utilised and the results were returned in a very fast time. If you’d like to know more about how we are using CONNECT, then just get in touch. This entry was posted in Connectivity, Data Flow, Databases, MariaDB, Oracle, Uncategorized and tagged CONNECT, Maria DB, Maria DB 10.0.22, Maria DB SQL, MariaDB, MariaDB 10.0.22, MariaDB SQl, Oracle, Oracle 11g, Oracle PL/SQL, Query. Bookmark the permalink.